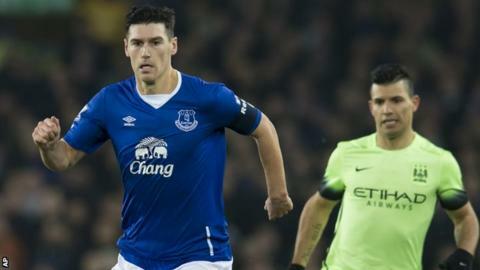 Everton manager Roberto Martinez described Gareth Barry as "one of the best English players ever" after a masterclass in the League Cup semi-final win over Manchester City. Romelu Lukaku's 19th goal of the season - from a Barry cross - gave Everton a 2-1 first-leg victory at Goodison Park. Jesus Navas had earlier cancelled out Ramiro Funes Mori's opener for Everton. "I have never seen a player with such an incredible professionalism as Gareth Barry," said Martinez. "Gareth is one of those players who gets underrated. "The reason we have so many developing young players is there are leaders in the mould of Gareth Barry. It is no coincidence when we have Gareth Barry around them." Martinez said he could build a team around the 34-year-old midfielder, who made 53 appearances for England between 2000 and 2012. He added: "For me, he is one of the best English players ever. He could reach 600 Premier League appearances this season." Everton's manager was delighted with his side's win - but said it would be "foolish" to contemplate the prospect of an all-Merseyside final at Wembley, with Liverpool holding the advantage over Stoke City in the other semi-final. He said: "We know we have a momentous, huge second leg and we will have 8,000 Evertonians with us at Etihad Stadium. We wanted to win the first leg and we have done that. "I am very, very proud of our performance. We conceded a goal to a really good counter attack but showed a winning mentality to come right back. We showed great character." Martinez fears defender Seamus Coleman could be out for a month with a calf injury, while midfielder Tom Cleverley was also forced off with a similar problem. Lukaku, who scored his 12th goal in 12 games, hurt an ankle - but the Everton boss hopes it is not serious. However, the Belgium international may miss the FA Cup third-round match against Dagenham and Redbridge at Goodison Park on Saturday (kick-off 15:00 GMT). "Romelu had a knock on his ankle," Martinez said. "We are going to assess him. I don't know if he will be available for the weekend. "Tom and Seamus are very similar, Seamus with his calf is probably the most serious. Those things are between three to four weeks."